You are in the process of creating a booking for a specific quantity of passengers, due to system restrictions, each booking should contain the same number of passengers travelling, Would you like to start new booking? Are you sure you want to remove this service? if you are travelling on a return ticket, the system would cancel outbound and inbound flight. are you sure you want to delete this itinerary? If the passengers journey involves an ultimate destination or stop in a country other than the country of departure‚ the Warsaw Convention may be applicable and the Convention governs and in most cases limits the liability of the carrier for death or personal injury and in respect of loss of damage to baggage. As used in this contract‚ "ticket" means this passenger ticket and baggage check‚ of which these conditions and notices form part‚ "carriage" is equivalent to "transportation"‚ "carrier" means all air carriers that carry the passengers or his baggage hereunder or perform‚ any other service incidental to such air carriage‚ "Warsaw Convention" means the Convention for the Unification of Certain Rules relation to international carriage by Air signed at the Warsaw Convention‚ 12th October 1929‚ or that Convention as amended at The Hague‚ 25th September 1955‚ whichever may be applicable. All carriage by air hereunder (including carriage which is not "international carriage" as defined by the Warsaw Convention‚ carriage excluded from the terms of the convention and all other carriage by air of whatever nature whether specifically mentioned in the convention or not) is subject to the rules and limitations relating to the liability established by the Warsaw Convention and to (I) provisions contained in this ticket‚ (ii) applicable tariffs‚ (iii) carriers conditions of carriage and related regulations which are made part thereof in the carriage of passengers the liability of the carriage for each passenger is limited to a sum being the Kenya shilling equivalent to US$20‚000‚ in the carriage of registered luggage and goods the liability of the carrier is limited to a sum being the Kenya shilling equivalent to US$10 per kilogram. The Carriers name may be abbreviated in the ticket‚ the full name and its abbreviation being set forth in carriers tariffs‚ conditions of carriage‚ regulations or timetable‚ carriers address shall be the airport of departure shown opposite the first abbreviation of carriers name in the ticket‚ the agreed stopping places are those places set forth in this ticket or shown in the carriers timetables as scheduled stopping places on the passengers route; carriage to be performed hereunder by several successive carriers is regarded as a single operation. An air carrier issuing a ticket for carriage over the lines of another air carrier does so only as an agent. Any exclusion or limitation of liability of carrier shall apply to and for the benefit of agents‚ servants and representations of carrier and any person whose aircraft is used by the carrier for carriage and its agents‚ servants and representatives. Freight is carried strictly on a space availability basis. The company does not accept any liability for any direct or consequential costs arising from any delays in carriage due to any reasons whatsoever. In the event of the freight being lost or damaged during carriage then the Company's liability is limited to a maximum of Ksh 100 per kilo. No liability is accepted for cash‚ jewellery or other valuables. All claims for such events must be made in writing within 7 days of their occurrence. Carrier undertakes to use its best efforts to carry the passenger and baggage with reasonable dispatch. Times shown in timetable or elsewhere are not guaranteed and form no part of this contract. Carrier may without notice substitute alte;rnate carriers or aircraft‚ and may alte;r or omit stopping places shown on the ticket in case of necessity. Schedules are subject to change without notice. Carrier assumes no responsibility to making connections. Passengers shall comply with government travel requirements and must present entry or exit documents as required by the regulator. Arrive at the airport at a time as required by the carrier to be able to complete the required check in procedures. No agent‚ servant or representative of carrier has authority to alte;r‚ modify or waive any provision of this contract. On all services the luggage allowance is 15 kilos in soft bags. These allowances shall include all hand baggage. The carriage of excess baggage is at the sole discretion of the company after taking into consideration the aircraft being used and the number of passengers booked. When excess baggage is carried it will be charged at the prevailing freight charges. The company reserves the right to re-allocate seats if the passengers have not checked in 15 minutes before the departure time. .
Airkenya requires that it be informed in advance of persons with disabilities‚ physically challenges‚ illnesses or old age. If such a person is unable to lift themselves‚ reach an emergency exit unaided‚ communicate with the crew and unfasten a seat belt; such persons must be accompanied by two persons who will assist them during embarking and disembarking the aircraft and in cases of an emergency. Smoking is not permitted in any aircraft. Designated smoking areas at passengers terminals must be adhered to. The company is not responsible for any direct or consequential costs resulting from any delays to its services. Airkenya Express Ltd will only accept carriage of firearms between the following destinations: Nairobi‚ Mombasa‚ Malindi‚ Lamu‚ Diani‚ Kisumu‚ Eldoret IntI. and Lockichoggio. The contract evidenced hereby or contained herein shall be governed by the law of Kenya and any claim or dispute arising hereunder shall be determined by the Kenyan courts to the exclusion of the courts of any other country. If‚ for reasons of safety‚ an aircraft is unable to land at an airstrip‚ the Company reserves the right to fly the passengers to the nearest alte;rnative airstrip. The Company is not responsible for any consequential costs resulting from this. Passengers paying by Credit card will be required to present the card at the check-in desk for authentification. The Veterinary Officer (Wilson Airport) should be informed early of intent to travel or transport animals/animal prodiucts. Certificate of transport from where the meat/animal product is coming from. Above 10 days before date of travel: USD 20 fee per ticket if tickets have been issued. Between 9 to 5 days before date of travel: USD 50 fee per ticket. No-show tickets can be re-used on stand-by basis up to validity of ticket with a USD 20 amendment fee. Above 10 days before date of travel: Nil charge if ticket is not issued. Above 10 days before date of travel: USD 20 fee if ticket has been issued. Within 9 to 5 days to date of travel: USD 50 fee per change on firm basis OR 20 fee per change on standby basis. Within 4 days to date of travel: USD 100 fee per change on firm basis OR USD 20 fee per change on standby basis. Special Promotional fare tickets will be subject to separate terms and conditions. Please ensure you check with Airkenya Reservations before you purchase tickets. Passenger unable to travel for health reasons refunds in this case will be considered on an individual basis however a handling fee of 30 per ticket is payable. In all cases refunds will be paid within 45 days from date of cancellation. Tickets are not transferable. Penalties are payable IN CASH before date of travel. Tickets are valid for six months. 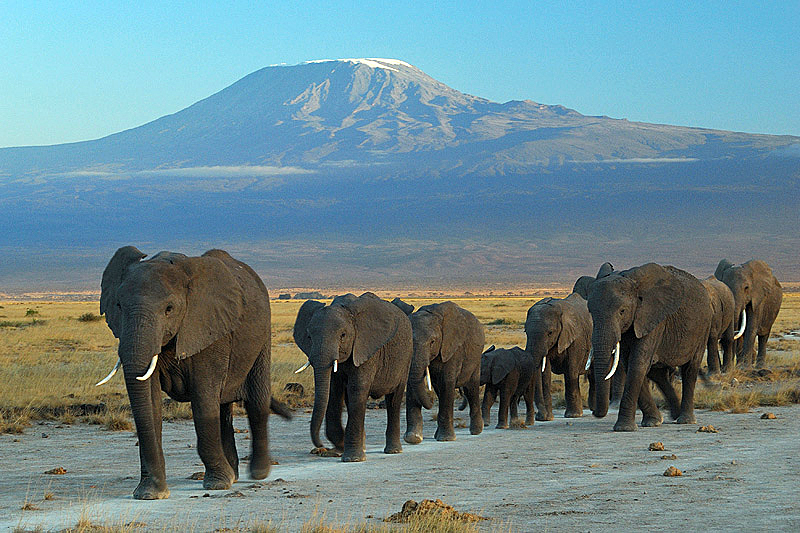 Amboseli lies to the south of Nairobi and it is famous for its big game and the majestic snowcapped Mt Kilimanjaro, Africa's tallest mountain. The name "Amboseli" comes from a Maasai word meaning "salty dust", and its popularity lies in its abundance of elephant, lion and cheetah. Airkenya flies daily to Amboseli National Park, a short 30 - 40 minute flight, in a Dash 8, or Dash 6 or Caravan respectively. Bird life is prolific especially near the lakes and swamps where you find waters birds. The Madagascar Squacco Heron shows up in intervals and the long toed lapwing is resident in small numbers. Yellow-throated chestnut bellied and black faced water in hundreds during the dry season. Catch one of our daily flights to experience natural diversity and overwhelming beauty of Amboseli. Activities in Amboseli include: game viewing bird watching, hiking, camel safaris, visit to Maasai homesteads, climbs on Mount Kilimanjaro. Clients flying from Amboseli can connect to Mara 1030hrs.